Capt Manoj Kumar Pandey was a man on golden heart. He was very fond of kids. This 22 year old army man never wasted an opportunity to inspire the kids he met by speaking with them about the Indian armed forces and their contribution for the nation. Kind hearted, ever smiling and an emotional human being Capt Manoj Kumar Pandey was among the youngest and the most loved in his regiment. Kargil war is one of the bloodiest and the most difficult battle fought on Indian soil, claiming lives of many brave Indian soldiers. Despite Indian armed forces having strategical disadvantage our forces displayed immense bravery to reclaim Point 4660. Captain Manoj Kumar Pandey’s regiment 11 gorkha rifles was serving in Siachen while the Kargil war broke up. The regiment was called in to re capture Khalubar post a strategic point which could have decided the end of Kargil conflict. Irrespective of the fact that 16 Grenadiers and 3 Punjab regiment soldiers were killed by Pakistani army in heavy mortar and gun firing post they launched an operation to capture Khalubar post Captain Manoj Kumar Pandey understood the gravity of situation and volunteered re capture Khalubar post. Not many in this country would want to fight for their mother land knowing the fact that they would be killed for sure. Captain Manoj Kumar Pandey’s love for this nation was incomparable. While operation Vijay was launched Captain Manoj and his team captured Batalik sector after exchanging heavy gun fire, a very important location which helped Indian army to station bofors gun to aim at Pakistan army stationed at 5,307 feet above the sea level. 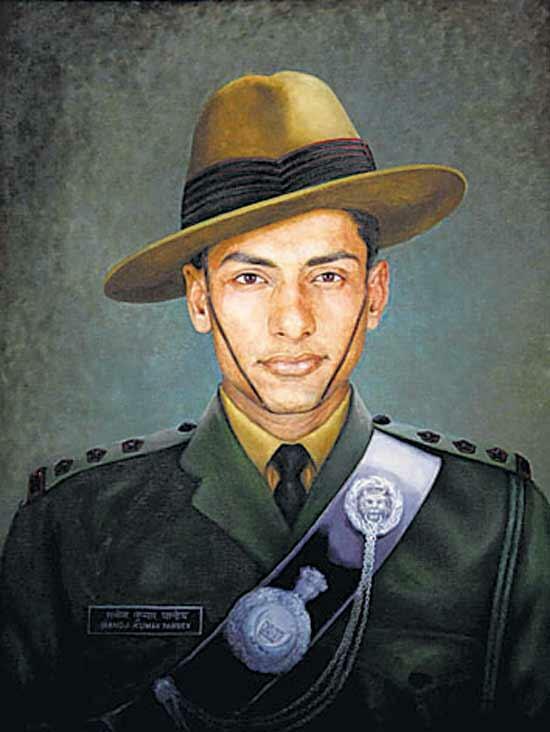 It was 3rd of July 1999 and the temperature had dipped to -14 degree but that didn’t hinder the spirit of Captain Manoj Kumar Pandey and his 11 gorkha rifles regiment. Post capturing Batalik sector Captain Manoj Kumar Pandey headed off towards Khalubar post and engaged in heavy shelling with the Pakistani Army, Manoj Kumar and his regiment waited for mid night to launch a flush out attack on enemies. It was around 10 pm when 11 Gorkha Rifles lead by Manoj Kumar Pandey launched full fledge firing at the enemy post. The firing lasted for more than 4 hours causing casualty on both side. It was about 2 am when Captain Manoj Kumar Pandey and his 11 gorkha rifles soldiers decided to launch a attack again on the enemy camp He confronting the enemies from right while his rest of team took position of attacking the enemies from left side. He killed four soldiers on Khalubar points. But this combat left Manoj fatally wounded as he was hit by bullets his hands hug below his shoulders, Manoj calls his soldiers and asks him to tie his half detached hand around his waist using his belt and lodged a grenade on enemy bunkers destroying it completely. Manoj Kumar Pandey was critically injured and succumbed to injury killing many enemies and capturing Khalubar post which was critical for Indian army in their win against Pakistan in Kargil war. As Capt Manoj Kumar Pandey breathed his last breath he screamed at his fellow soldiers saying “Na Chodnu” (Don’t Leave Them don’t leave anyone) Kill them all and tell the country we took back our mother land. He was just 22 years old when he sacrificed his life to protect you and me. A 22 year old boy who could have spent a lavish life working for a software company choose to die for this nation because his love for the nation and carve for PARAM VIR CHAKRA was of no match when compared with any of us. It is very unfortunate that we Indians don’t remember their sacrifice. If I am writing this article and if you have had a chance to read this then this is only because of brave souls like Capt Manoj Kumar Pandey. He was awarded PARAM VIR CHAKRA for his bravery and supreme sacrifice. The bravery of Soldiers like Capt Manoj Kumar Pandey should be told to every Indian. Warriors like these are not born often and when they are born they leave a legendary story behind them. For me Capt Manoj Kumar Pandey will always remain one of the greatest warrior and an inspiration. This 22 year old Capt Manoj Kumar Pandey should remain an Icon of this great nation and his sacrifice to protect mother India should never go waste.